Jan. 17, 2019—Some words of wisdom from our philosopher-founder Benjamin Franklin are surely appropriate in these times, and his 313th birthday—to be celebrated today—is a good time to pay them heed. Old Ben is known for shaping many aspects of our fight for independence, but one area which is often overlooked is his attention to economic policy. It’s to that aspect that I turn my attention today. The key to a successful economy, as the American System attests, is scientific and technological progress, an objective to which Franklin can be said to have devoted his life. In addition to his own scientific work and inventions, he was constantly seeking to improve conditions of life for his community through the establishment of institutions such as libraries, fire departments, and the University of Pennsylvania. Indeed, the establishment of the U.S. government itself can be considered one of those institutions he played an indispensable role in founding. 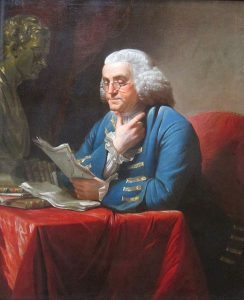 One of the many societies which Franklin helped to form after his return to America from France in 1785 was the Society for Political Inquiries. 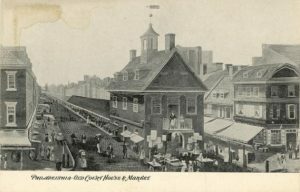 That group, explicitly devoted to the discussion of matters of government and political economy, then spawned the Pennsylvania Society for Promotion of Manufactures and the Useful Arts. During the Constitutional Convention, this group , which brought together Tench Coxe, Robert Morris, Gouverneur Morris, and Mathew Carey (among others), met at Franklin’s home to discuss the economic policy required for economic independence, and produced a short pamphlet which was circulated at the Convention itself. Franklin’s attention to political economy can be traced back to at least 1729, when he produced a substantial paper on the question of the role of a state paper currency. In it he stresses the importance of a source for cheap, abundant credit in order to achieve prosperity. Numerous colonies had undertaken to create such credit, despite opposition from Mother England, and found the measures to be successful in fostering commerce, and the rudiments of manufacturing. 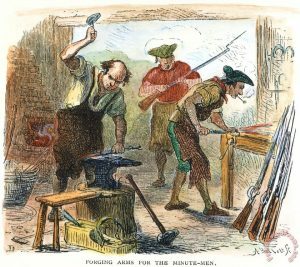 England’s opposition to this impulse to develop became increasing strenuous as time went on, and led not only to bans on certain kinds of manufactures—iron and hats should come to mind—but also to the issuance of credit (currency) itself. The British Currency Acts of 1763 and 1764 went so far as to demand the elimination of all local scrip, and a return to use of nothing but English money. This dramatically reduced the buying power of the Americans. It is reported that Franklin himself commented that these measures amounted to a body-blow against the American economy, creating depression conditions—and obviously a more fertile field for the revolutionary upsurge that was to come. As part of this blog’s mission to educating Americans on the political-economic principles which built our economy, I reprint below Franklin’s 1729 Treatise on the “Nature and Necessity of a Paper Currency.” It is a precursor to the fuller development of the American System carried out by Alexander Hamilton and others in the Revolutionary period. Nothing has been cut from this lengthy document. First, A great Want of Money in any Trading Country, occasions Interest to be at a very high Rate. And here it may be observed, that it is impossible by any Laws to restrain Men from giving and receiving exorbitant Interest, where Money is suitably scarce: For he that wants Money will find out Ways to give 10 per Cent. when he cannot have it for less, altho’ the Law forbids to take more than 6 per Cent. Now the Interest of Money being high is prejudicial to a Country several Ways: It makes Land bear a low Price, because few Men will lay out their Money in Land, when they can make a much greater Profit by lending it out upon Interest: And much less will Men be inclined to venture their Money at Sea, when they can, without Risque or Hazard, have a great and certain Profit by keeping it at home; thus Trade is discouraged. And if in two Neighbouring Countries the Traders of one, by Reason of a greater Plenty of Money, can borrow it to trade with at a lower Rate than the Traders of the other, they will infallibly have the Advantage, and get the greatest Part of that Trade into their own Hands; For he that trades with Money he hath borrowed at 8 or 10 per Cent. cannot hold Market with him that borrows his Money at 6 or 4. — On the contrary, A plentiful Currency will occasion Interest to be low: And this will be an Inducement to many to lay out their Money in Lands, rather than put it out to Use, by which means Land will begin to rise in Value and bear a better Price: And at the same Time it will tend to enliven Trade exceedingly, because People will find more Profit in employing their Money that Way than in Usury; and many that understand Business very well, but have not a Stock sufficient of their own, will be encouraged to borrow Money to trade with, when they can have it at moderate Interest. Secondly, Want of Money in a Country reduces the Price of that Part of its Produce which is used in Trade: Because Trade being discouraged by it as above, there is a much less Demand for that Produce. And this is another Reason why Land in such a Case will be low, especially where the Staple Commodity of the Country is the immediate Produce of the Land, because that Produce being low, fewer People find an Advantage in Husbandry, or the Improvement of Land. — On the contrary, A Plentiful Currency will occasion the Trading Produce to bear a good Price: Because Trade being encouraged and advanced by it, there will be a much greater Demand for that Produce; which will be a great Encouragement of Husbandry and Tillage, and consequently make Land more valuable, for that many People would apply themselves to Husbandry, who probably might otherwise have sought some more profitable Employment. As we have already experienced how much the Increase of our Currency by what Paper Money has been made, has encouraged our Trade; particularly to instance only in one Article, Ship-Building; it may not be amiss to observe under this Head, what a great Advantage it must be to us as a Trading Country, that has Workmen and all the Materials proper for that Business within itself, to have Ship-Building as much as possible advanced: For every Ship that is built here for the English Merchants, gains the Province her clear Value in Gold and Silver, which must otherwise have been sent Home for Returns in her Stead; and likewise, every Ship built in and belonging to the Province, not only saves the Province her first Cost, but all the Freight, Wages and Provisions she ever makes or requires as long as she lasts; provided Care is taken to make This her Pay Port, and that she always takes Provisions with her for the whole Voyage, which may easily be done. And how considerable an Article this is yearly in our Favour, every one, the least acquainted with mercantile Affairs, must needs be sensible; for if we could not Build our selves, we must either purchase so many Vessels as we want from other Countries, or else Hire them to carry our Produce to Market, which would be more expensive than Purchasing; and on many other Accounts exceedingly to our Loss. Now as Trade in general will decline where there is not a plentiful Currency, so Ship-Building must certainly of Consequence decline where Trade is declining. Thirdly, Want of Money in a Country discourages Labouring and Handicrafts Men (which are the chief Strength and Support of a People) from coming to settle in it, and induces many that were settled to leave the Country, and seek Entertainment and Employment in other Places, where they can be better paid. For what can be more disheartning to an industrious labouring Man, than this, that after he hath earned his Bread with the Sweat of his Brows, he must spend as much Time, and have near as much Fatigue in getting it, as he had to earn it. And nothing makes more bad Paymasters than a general Scarcity of Money. And here again is a Third Reason for Land’s bearing a low Price in such a Country, because Land always increases in Value in Proportion with the Increase of the People settling on it, there being so many more Buyers; and its Value will infallibly be diminished, if the Number of its Inhabitants diminish. — On the contrary, A Plentiful Currency will encourage great Numbers of Labouring and Handicrafts Men to come and Settle in the Country, by the same Reason that a Want of it will discourage and drive them out. Now the more Inhabitants, the greater Demand for Land (as is said above) upon which it must necessarily rise in Value, and bear a better Price. The same may be said of the Value of House-Rent, which will be advanced for the same Reasons; and by the Increase of Trade and Riches People will be enabled to pay greater Rents. Now the Value of House-Rent rising, and Interest becoming low, many that in a Scarcity of Money practised Usury, will probably be more inclined to Building; which will likewise sensibly enliven Business in any Place; it being an Advantage not only to Brickmakers, Bricklayers, Masons, Carpenters, Joiners, Glaziers, and several other Trades immediately employ’d by Building, but likewise to Farmers, Brewers, Bakers, Taylors, Shoemakers, Shop-keepers, and in short to every one that they lay their Money out with. Fourthly, Want of Money in such a Country as ours, occasions a greater Consumption of English and European Goods, in Proportion to the Number of the People, than there would otherwise be. Because Merchants and Traders, by whom abundance of Artificers and labouring Men are employed, finding their other Affairs require what Money they can get into their hands, oblige those who work for them to take one half, or perhaps two thirds Goods in Pay. By this Means a greater Quantity of Goods are disposed of, and to a greater Value; because Working Men and their Families are thereby induced to be more profuse and extravagant in fine Apparel and the like, than they would be if they were obliged to pay ready Money for such Things after they had earn’d and received it, or if such Goods were not imposed upon them, of which they can make no other Use: For such People cannot send the Goods they are paid with to a Foreign Market, without losing considerably by having them sold for less than they stand ’em in here; neither can they easily dispose of them at Home, because their Neighbours are generally supplied in the same Manner; But how unreasonable would it be, if some of those very Men who have been a Means of thus forcing People into unnecessary Expence, should be the first and most earnest in accusing them of Pride and Prodigality. Now tho’ this extraordinary Consumption of Foreign Commodities may be a Profit to particular Men, yet the Country in general grows poorer by it apace. — On the contrary, As A plentiful Currency will occasion a less Consumption of European Goods, in Proportion to the Number of the People, so it will be a means of making the Balance of our Trade more equal than it now is, if it does not give it in our Favour; because our own Produce will be encouraged at the same Time. And it is to be observed, that tho’ less Foreign Commodities are consumed in Proportion to the Number of People, yet this will be no Disadvantage to the Merchant, because the Number of People increasing, will occasion an increasing Demand of more Foreign Goods in the Whole. Since Men will always be powerfully influenced in their Opinions and Actions by what appears to be their particular Interest: Therefore all those, who wanting Courage to venture in Trade, now practise Lending Money on Security for exorbitant Interest, which in a Scarcity of Money will be done notwithstanding the Law, I say all such will probably be against a large Addition to our present Stock of Paper-Money; because a plentiful Currency will lower Interest, and make it common to lend on less Security. 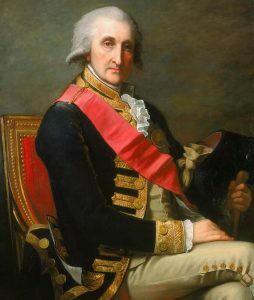 British nobility, such as Admiral Rodney shown here, often opposed paper currency. Lawyers, and others concerned in Court Business, will probably many of them be against a plentiful Currency; because People in that Case will have less Occasion to run in Debt, and consequently less Occasion to go to Law and Sue one another for their Debts. Tho’ I know some even among these Gentlemen, that regard the Publick Good before their own apparent private Interest. All those who are any way Dependant on such Persons as are above mentioned, whether as holding Offices, as Tenants, or as Debtors, must at least appear to be against a large Addition; because if they do not, they must sensibly feel their present Interest hurt. And besides these, there are, doubtless, many well-meaning Gentlemen and Others, who, without any immediate private Interest of their own in View, are against making such an Addition, thro’ an Opinion they may have of the Honesty and sound Judgment of some of their Friends that oppose it,(perhaps for the Ends aforesaid) without having given it any thorough Consideration themselves. And thus it is no Wonder if there is a powerful Party on that Side. On the other Hand, Those who are Lovers of Trade, and delight to see Manufactures encouraged, will be for having a large Addition to our Currency: For they very well know, that People will have little Heart to advance Money in Trade, when what they can get is scarce sufficient to purchase Necessaries, and supply their Families with Provision. Much less will they lay it out in advancing new Manufactures; nor is it possible new Manufactures should turn to any Account, where there is not Money to pay the Workmen, who are discouraged by being paid in Goods, because it is a great Disadvantage to them. As Providence has so ordered it, that not only different Countries, but even different Parts of the same Country, have their peculiar most suitable Productions; and likewise that different Men have Genius’s adapted to Variety of different Arts and Manufactures, Therefore Commerce, or the Exchange of one Commodity or Manufacture for another, is highly convenient and beneficial to Mankind. As for Instance, A may be skilful in the Art of making Cloth, and B understand the raising of Corn; A wants Corn, and B Cloth; upon which they make an Exchange with each other for as much as each has Occasion, to the mutual Advantage and Satisfaction of both. For many Ages, those Parts of the World which are engaged in Commerce, have fixed upon Gold and Silver as the chief and most proper Materials for this Medium; they being in themselves valuable Metals for their Fineness, Beauty, and Scarcity. By these, particularly by Silver, it has been usual to value all Things else: But as Silver it self is of no certain permanent Value, being worth more or less according to its Scarcity or Plenty, therefore it seems requisite to fix upon Something else, more proper to be made a Measure of Values, and this I take to be Labour. By Labour may the Value of Silver be measured as well as other Things. As, Suppose one Man employed to raise Corn, while another is digging and refining Silver; at the Year’s End, or at any other Period of Time, the compleat Produce of Corn, and that of Silver, are the natural Price of each other; and if one be twenty Bushels, and the other twenty Ounces, then an Ounce of that Silver is worth the Labour of raising a Bushel of that Corn. Now if by the Discovery of some nearer, more easy or plentiful Mines, a Man may get Forty Ounces of Silver as easily as formerly he did Twenty, and the same Labour is still required to raise Twenty Bushels of Corn, then Two Ounces of Silver will be worth no more than the same Labour of raising One Bushel of Corn, and that Bushel of Corn will be as cheap at two Ounces, as it was before at one; cæteris paribus. Thus the Riches of a Country are to be valued by the Quantity of Labour its Inhabitants are able to purchase, and not by the Quantity of Silver and Gold they possess; which will purchase more or less Labour, and therefore is more or less valuable, as is said before, according to its Scarcity or Plenty. As those Metals have grown much more plentiful in Europe since the Discovery of America, so they have sunk in Value exceedingly; for, to instance in England, formerly one Penny of Silver was worth a Days Labour, but now it is hardly worth the sixth Part of a Days Labour; because not less than Six-pence will purchase the Labour of a Man for a Day in any Part of that Kingdom; which is wholly to be attributed to the much greater Plenty of Money now in England than formerly. And yet perhaps England is in Effect no richer now than at that Time; because as much Labour might be purchas’d, or Work got done of almost any kind, for £100 then, as will now require or is now worth £600. In the next Place let us consider the Nature of Banks emitting Bills of Credit, as they are at this Time used in Hamburg, Amsterdam, London and Venice. Those Places being Seats of vast Trade, and the Payment of great Sums being for that Reason frequent, Bills of Credit are found very convenient in Business; because a great Sum is more easily counted in Them, lighter in Carriage, concealed in less Room, and therefore safer in Travelling or Laying up, and on many other Accounts they are very much valued. The Banks are the general Cashiers of all Gentlemen, Merchants and great Traders in and about those Cities; there they deposit their Money, and may take out Bills to the Value, for which they can be certain to have Money again at the Bank at any Time: This gives the Bills a Credit; so that in England they are never less valuable than Money, and in Venice and Amsterdam they are generally worth more. And the Bankers always reserving Money in hand to answer more than the common Run of Demands (and some People constantly putting in while others are taking out) are able besides to lend large Sums, on good Security, to the Government or others, for a reasonable Interest, by which they are paid for their Care and Trouble; and the Money which otherwise would have lain dead in their Hands, is made to circulate again thereby among the People: And thus the Running Cash of the Nation is as it were doubled; for all great Payments being made in Bills, Money in lower Trade becomes much more plentiful: And this is an exceeding great Advantage to a Trading Country, that is not over-stock’d with Gold and Silver. Therefore (to apply the Above to our own Circumstances) If Land in this Province was falling, or any way likely to fall, it would behoove the Legislature most carefully to contrive how to prevent the Bills issued upon Land from falling with it. But as our People increase exceedingly, and will be further increased, as I have before shewn, by the Help of a large Addition to our Currency; and as Land in consequence is continually rising, So, in case no Bills are emitted but what are upon Land Security, the Money-Acts in every Part punctually enforced and executed, the Payments of Principal and Interest being duly and strictly required, and the Principal bona fide sunk according to Law, it is absolutely impossible such Bills should ever sink below their first Value, or below the Value of the Land on which they are founded. In short, there is so little Danger of their sinking, that they would certainly rise as the Land rises, if they were not emitted in a proper Manner for preventing it; That is, by providing in the Act That Payment may be made, either in those Bills, or in any other Bills made current by any Act of the Legislature of this Province; and that the Interest, as it is received, may be again emitted in Discharge of Publick Debts; whereby circulating it returns again into the Hands of the Borrowers, and becomes Part of their future Payments; and thus as it is likely there will not be any Difficulty for want of Bills to pay the Office, they are hereby kept from rising above their first Value: For else, supposing there should be emitted upon mortgaged Land its full present Value in Bills; as in the Banks in Europe the full Value of the Money deposited is given out in Bills; and supposing the Office would take nothing but the same Sum in those Bills in Discharge of the Land; as in the Banks aforesaid, the same Sum in their Bills must be brought in, in order to receive out the Money: In such Case the Bills would most surely rise in Value as the Land rises; as certainly as the Bank Bills founded on Money would fall if that Money was falling. Thus if I were to mortgage to a Loan-Office, or Bank, a Parcel of Land now valued at £100 in Silver, and receive for it the like Sum in Bills, to be paid in again at the Expiration of a certain Term of Years; before which, my Land rising in Value, becomes worth £150 in Silver: ’Tis plain, that if I have not these Bills in Possession, and the Office will take nothing but these Bills, or else what it is now become worth in Silver, in Discharge of my Land; I say it appears plain, that those Bills will now be worth £150 in Silver to the Possessor; and if I can purchase them for less, in order to redeem my Land, I shall by so much be a Gainer. When there is no Money in a Country, all Commerce must be by Exchange. Now if it takes one fourth Part of the Time and Labour of a Country, to exchange or get their Commodities exchanged; then, in computing their Value, that Labour of Exchanging must be added to the Labour of manufacturing those Commodities: But if that Time or Labour is saved by introducing Money sufficient, then the additional Value on Account of the Labour of Exchanging may be abated, and Things sold for only the Value of the Labour in making them; because the People may now in the same Time make one Fourth more in Quantity of Manufactures than they could before. If we enquire, How much per Cent. 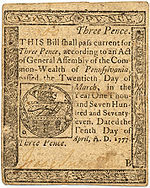 Interest ought to be required upon the Loan of these Bills; we must consider what is the Natural Standard of Usury: And this appears to be, where the Security is undoubted, at least the Rent of so much Land as the Money lent will buy: For it cannot be expected that any Man will lend his Money for less than it would fetch him in as Rent if he laid it out in Land, which is the most secure Property in the World. But if the Security is casual, then a kind of Ensurance must be enterwoven with the simple natural Interest, which may advance the Usury very conscionably to any height below the Principal it self. Now among us, if the Value of Land is twenty Years Purchase, Five per Cent. is the just Rate of Interest for Money lent on undoubted Security. Yet if Money grows scarce in a Country, it becomes more difficult for People to make punctual Payments of what they borrow, Money being hard to be raised; likewise Trade being discouraged, and Business impeded for want of a Currency, abundance of People must be in declining Circumstances, and by these Means Security is more precarious than where Money is plenty. On such Accounts it is no wonder if People ask a greater Interest for their Money than the natural Interest; and what is above is to be look’d upon as a kind of Præmium for the Ensurance of those Uncertainties, as they are greater or less. Thus we always see, that where Money is scarce, Interest is high, and low where it is plenty. Now it is certainly the Advantage of a Country to make Interest as low as possible, as I have already shewn; and this can be done no other way than by making Money plentiful. And since, in Emitting Paper Money among us, the Office has the best of Security, the Titles to the Land being all skilfully and strictly examined and ascertained; and as it is only permitting the People by Law to coin their own Land, which costs the Government nothing, the Interest being more than enough to pay the Charges of Printing, Officers Fees, &c. I cannot see any good Reason why Four per Cent. to the Loan-Office should not be thought fully sufficient. As a low Interest may incline more to take Money out, it will become more plentiful in Trade; and this may bring down the common Usury, in which Security is more dubious, to the Pitch it is determined at by Law. If it should be objected, That Emitting It at so low an Interest, and on such easy Terms, will occasion more to be taken out than the Trade of the Country really requires: It may be answered, That, as has already been shewn, there can never be so much of it emitted as to make it fall below the Land it is founded on; because no Man in his Senses will mortgage his Estate for what is of no more Value to him than That he has mortgaged, especially if the Possession of what he receives is more precarious than of what he mortgages, as that of Paper Money is when compared to Land: And if it should ever become so plenty by indiscreet Persons continuing to take out a large Overplus, above what is necessary in Trade, so as to make People imagine it would become by that Means of less Value than their mortgaged Lands, they would immediately of Course begin to pay it in again to the Office to redeem their Land, and continue to do so till there was no more left in Trade than was absolutely necessary. And thus the Proportion would find it self, (tho’ there were a Million too much in the Office to be let out) without giving any one the Trouble of Calculation. It may perhaps be objected to what I have written concerning the Advantages of a large Addition to our Currency, That if the People of this Province increase, and Husbandry is more followed, we shall overstock the Markets with our Produce of Flower, &c. To this it may be answered, that we can never have too many People (nor too much Money) For when one Branch of Trade or Business is overstocked with Hands, there are the more to spare to be employed in another. So if raising Wheat proves dull, more may (if there is Money to support and carry on new Manufactures) proceed to the raising and manufacturing of Hemp, Silk, Iron, and many other Things the Country is very capable of, for which we only want People to work, and Money to pay them with. Upon the Whole it may be observed, That it is the highest Interest of a Trading Country in general to make Money plentiful; and that it can be a Disadvantage to none that have honest Designs. It cannot hurt even the Usurers, tho’ it should sink what they receive as Interest; because they will be proportionably more secure in what they lend; or they will have an Opportunity of employing their Money to greater Advantage, to themselves as well as to the Country. Neither can it hurt those Merchants who have great Sums out-standing in Debts in the Country, and seem on that Account to have the most plausible Reason to fear it; to wit, because a large Addition being made to our Currency, will increase the Demand of our Exporting Produce, and by that Means raise the Price of it, so that they will not be able to purchase so much Bread or Flower with £100 when they shall receive it after such an Addition, as they now can, and may if there is no Addition: I say it cannot hurt even such, because they will get in their Debts just in exact Proportion so much the easier and sooner as the Money becomes plentier; and therefore, considering the Interest and Trouble saved, they will not be Losers; because it only sinks in Value as a Currency, proportionally as it becomes more plenty. It cannot hurt the Interest of Great Britain, as has been shewn; and it will greatly advance the Interest of the Proprietor. It will be an Advantage to every industrious Tradesman, &c. because his Business will be carried on more freely, and Trade be universally enlivened by it. And as more Business in all Manufactures will be done, by so much as the Labour and Time spent in Exchange is saved, the Country in general will grow so much the richer. As this Essay is wrote and published in Haste, and the Subject in itself intricate, I hope I shall be censured with Candour, if, for want of Time carefully to revise what I have written, in some Places I should appear to have express’d myself too obscurely, and in others am liable to Objections I did not foresee. I sincerely desire to be acquainted with the Truth, and on that Account shall think my self obliged to any one, who will take the Pains to shew me, or the Publick, where I am mistaken in my Conclusions, And as we all know there are among us several Gentlemen of acute Parts and profound Learning, who are very much against any Addition to our Money, it were to be wished that they would favour the Country with their Sentiments on this Head in Print; which, supported with Truth and good Reasoning, may probably be very convincing. And this is to be desired the rather, because many People knowing the Abilities of those Gentlemen to manage a good Cause, are apt to construe their Silence in This, as an Argument of a bad One. Had any Thing of that Kind ever yet appeared, perhaps I should not have given the Publick this Trouble: But as those ingenious Gentlemen have not yet (and I doubt never will) think it worth their Concern to enlighten the Minds of their erring Countrymen in this Particular, I think it would be highly commendable in every one of us, more fully to bend our Minds to the Study of What is the true Interest of Pennsylvania; whereby we may be enabled, not only to reason pertinently with one another; but, if Occasion requires, to transmit Home such clear Representations, as must inevitably convince our Superiors of the Reasonableness and Integrity of our Designs.